Ordered the largest size and it fits my large arms pretty well. Not sure about the price -- a little bit overpriced for me, but not much. Comfortable. Good fit. Nice padding. The name of the item says it all: premium. I also purchased one of the regular models, which is significantly cheaper and this definitely is a step above. The elastic is comfortable and fits very nicely. 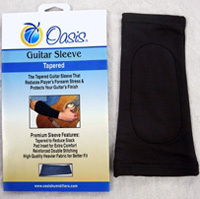 A softer material than the regular Oasis sleeve as well. The added pad is a very nice touch, it makes playing very comfy. I was worried about damaging the finish on my instruments and my arm would stick to them while sweating and this eliminates it. The sleeve must allow extra air to get in and actually reduces sweat. Definitely measure your forearm before buying so you get the right fit. My forearm measures around 11 3/4” and it fits perfectly. I know in the sizing it says 12” plus. I’m not sure how it will do after 14”, I’m sure it will stretch but it’s hard to say how much. Either way great buy, treat your guitars right. It’s much cheaper that refinishing an expensive instrument.